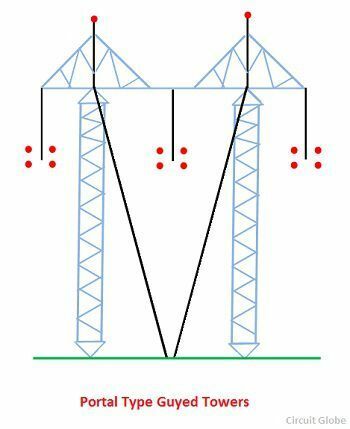 Definition: The different types of structure (poles or towers) used for supporting the overhead lines or wires, such types of structures are called line supports. The line support plays a major role in power transmission. It kept the proper spacing between the conductors and maintained the conductor at the prescribed distance from its ground parts. It also maintained the specified ground clearance. These clearances are decided by the electrical and mechanical considerations. The choice of electrical poles depends on the cost, atmosphere, and line voltage of the line.The electrical poles are mainly classified into following types. 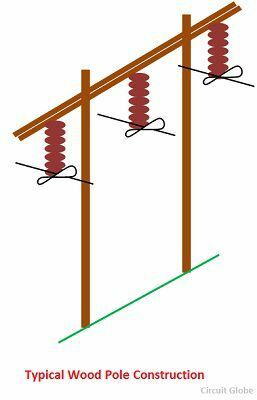 It is one of the cheapest types of line supports and used for lines where spans are short, and tension is low. The wood poles have the limitations of height and diameter. The double pole structure of the A or H types is used where greater strength is required. The strength of these types of constructions varies from two to four times the strength of the single pole. H-type of construction is usually employed for four terminal poles or those carrying switchgear and transformers. Wood pole has a natural insulating property, and lesser flashovers are likely to take place due to lightning. One of the drawbacks of wood poles is that their strength and durability cannot be predicted with certainty. Concrete pole gave greater strength and used in place of a wood pole. It has a longer life than that of a wood pole because of little degradation. Their maintenance cost is low. Concrete poles are very heavy and are liable to damage during loading, unloading, transportation and erection due to their brittle nature. Handlings and transportation difficulties are overcome by the use of pre-stressed concrete supports which can be manufactured in pieces and then assembled at the job sites. The weight of pre-stressed concrete poles is more durable than any other type of pole. The material used is less, and it is more durable than any other types of poles. For low and medium voltage tubular steel poles or Grider steel supports are used. Longer spans are possible with steel poles. The poles need to be galvanised or painted periodically to prevent them from corrosion. Their maintenance expense is high. The electrical tower is defined as the tower which is used for carrying the high voltage (above 230 kV) transmission lines. 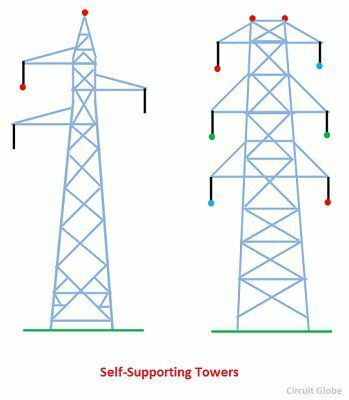 Such types of towers are made up aluminium or steel which gives them strength for supporting the heavy electrical conductor. The electrical towers are broadly classified into various types. These types are explained below. Tangent Tower – It is used for a straight run of the line. Suspension insulators are used with these towers. 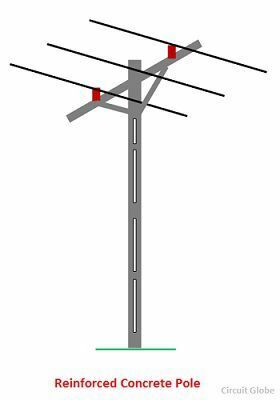 Deviation Tower – It is used in a line where the transmission line changes direction. Strain insulators are used with these towers. They have a broader base, stronger members and are costlier as compared to tangent towers. The narrow-based design requires less steel or aluminium in comparison with a wide base tower, but its cost of foundation is more. The selection between the two is based on the costs of material, foundations, and right-of-way requirement. 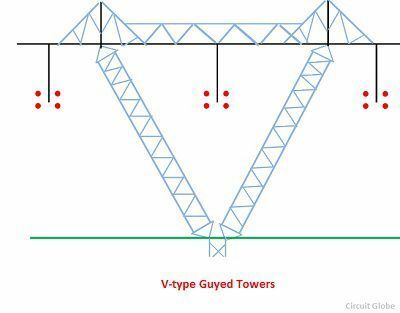 Such types of towers are either portal types or V-types. Both of them had two supports connected at the top by a cross arm and provided with four guys. In portal structure, each supports is resting on its foundation, whereas in V-support structure the two supports are resting at an angle to one another on one thrust footing only which is of heavier of type.